The goal of any online store is to ensure the maximum possible visibility for itself over the web. With our first-class Cart eBay integration services at ChannelSale, you can easily integrate your ecommerce store with eBay, one of the biggest online marketplaces existing now on the web. At the moment, eBay is accessible in as many as 150 different countries. This means that eBay integration is likely to give a huge online exposure to your web store. We make use of the best software management tools for the integration process, and our CS Cart eBay connector ensures the synchronization with eBay is proper and effective for your store across all levels. We can provide you with the highest amount of exposure across the widest number of channels over the web. Whether you want real-time inventory management or automated product listing, we can offer the service that you need and take the arduous task of store management from your shoulders, leaving you relaxed and with more time to concentrate on other business areas. We make sure that your store products are synced properly with the ideal item categories on eBay and use granular level item category mappings along with CS Cart eBay app for this purpose. We mark up your store item costs for different shopping engines online and keep varying cost structure for eBay and various other marketplaces. For each order that is generated over eBay, we can create fresh orders on your CS Cart store using the CS Cart eBay extension. We assist you in managing your store by offering you varied services, such as user logging activity updates, product stock updates and shipping and order tracking management services. We can create a parent-child bond for eBay with your store and use CS Cart eBay plugin to make sure that the synchronization is always smooth and effective. We offer support for any product – single, varied, single, multi-variational, group items, kits and more. We help you in selling items of any type, colour, size or shape. 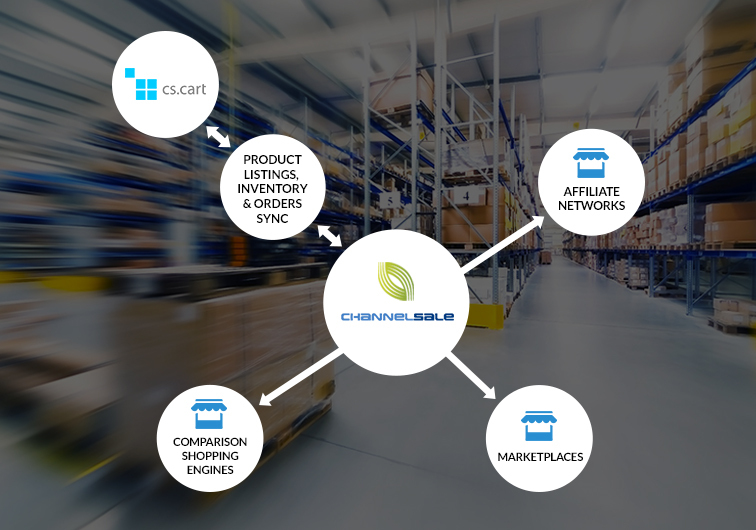 Mail us today at info@channelsale.com or call us on +1-866-709-9495 to talk with a ChannelSale Client Service Executive and know more about us or to begin immediately.